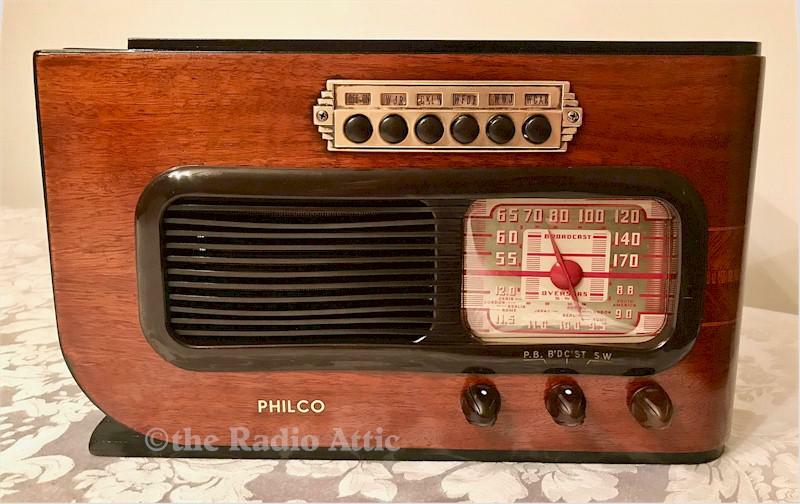 Introduced in Philco's 1940 fall lineup, this was their very special "Sled" with the finned side, inlaid herring bone style accent veneers and push button pre-set tuning and dial tuning. They even eliminated the on-off switch that was normally on the volume control and assigned that function to the top left push button, which was advanced design for the era. Original knobs, push buttons, brass station ID bracket and even the original station tags. Lots of Art Deco influence in this one! The cabinet has been lovingly refinished using the very finest toning and finishing lacquers, producing a gorgeous finish. The electronics have been completely restored (no shortcut repairs and it is internally fused for your safety), and it plays very nicely on the AM Broadcast and shortwave bands, utilizing the original internal loop antenna. Just a beautiful set! 12-1/2"W x 8"H x 6-1/4"D.